Raaz Reboot is a 2016 Bollywood horror film featuring Emraan Hashmi as Aditya, Kriti Kharbanda as Shaina and Gaurav Arora as Rehaan in lead roles. 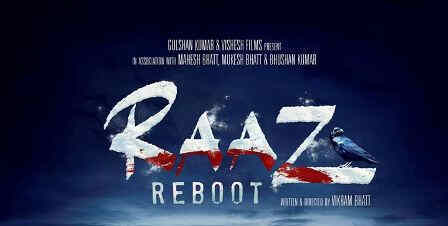 Raaz Reboot is the fourth installment in the Raaz series and is written and directed by Vikram Bhatt. The film starts with a happily married couple, Rehaan and Shaina, who move into a new house in Romania. Soon they get into arguments as Rehaan becomes distant from his wife and is a little cold to her. Shaina insists Rehaan share the secret that he is hiding from her but he finds ways to avoid her. Many instances prove to Shaina that her house is haunted and there exists an evil spirit which she tries to explain to Rehaan and pleads him to move out of the house but Rehaan finds her stories imaginary. Shaina's ex-boyfriend Aditya makes an entry and acts supportive and hints that the evil spirit seeks revenge from Rehaan and not her. Will Shaina listen to Aditya and doubt her husband and will she be able find out the secret that Rehaan is hiding from her forms the remaining part of the story. The performances, dialogues delivery, picturisation, visual effects and the background score are satisfactory and will interest people who love watching horror films.